There are too much-paid process available to Bypass FRP Huawei Mate P20 Pro, but we are here to share with you another free latest method that helps you to unlock frp lock from your device, but this process has too many steps, all you know after the update of latest patch than on the talkback option “Help & Feedback” option is missing. and this is the main problem because we can’t access “Chrome” browser that helps to Bypass Google Account verification from Huawei mate 20 pro and mate 20″ so in 2019 we share with you the latest method to unlock frp Huawei Mate 20 Pro easily. Note:- Bypass FRP Files not responsible for any damage on your device please try this at your own risk. -First of all, remove the sim card from your Huawei devices. -Now you need to boot your device into recovery mode. by long press ‘Volume UP + Power Key” together, until you see the “Huawei” logo. -Once you see “Huawei” logo on your device then release the “Power” key but keep pressing the “Volume UP” key until you see “EMUI” logo. -After that, select “Wipe data & Factory Reset” option. -Once “factory reset” successfully, then you will get the “Reboot system now” option to reboot your Huawei mate 20 pro device. -Now once your Huawei device is power on the “insert the working sim card”, because you need the internet connection to Bypass frp Huawei Mate 20 Pro. -Then restart your device and once power on then change the language to “English”. -Now you will see your device auto internet access into the top left bar. -After that, tap on the “Get Started”. -Then select “I have carefully read & agreed to the phone terms”. -Now tap on the “Next” button. -Ok Then you will get the “Data Import” options screen. -After that, tap on the “Android Device” => then tap on “Agree”. -Then tap on the “Allow” option multiple times. -Then, at last, you will get a popup window of “Disable Mobile data”, just tap on the “Keep On” option. -Now connect another Android device to your Huawei Mate 20 pro devices to successfully Bypass FRP Huawei Mate 20 Pro easily. -Now open the “Chrome” browser in your another device. -Once you get the search results, then tap on the first website from there, website URL should start with “Bypassfrpfiles.com”. -Type in the search box “Bypassfrpfiles.com”. -Then visit the website and then tap on the “Download FRP tools” from the top menu bar. -After that, tap on the “Download FRP Bypass Applications”. 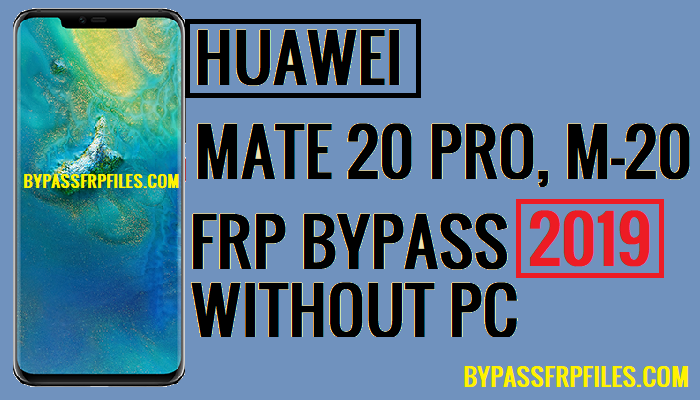 -Now you will successfully access the “Bypass FRP” page, now download from there this two applications to Bypass FRP Huawei Mate 20 Pro. -But at first, we need to download only one application that helps you to Bypass FRP Samsung S10 and S10 Plus without PC easily. -Once the file downloading finish then you will get “Open” button, just click on that and install the applications successfully. -Once installation finish, now downloads the second app “File Commander”. -Wait for downloading finish, once downloading finish then you will get once again “open” button, then install the File Commander” applications to your other Android devices. -Open the “Chrome Browser” to your PC or laptop or other Android Phone. -Search on the chrome “BypassFRPFiles.com” then tap on the first website from there, website URL should start with “Bypassfrpfiles.com”. -Now download the “Quick Shortcut Maker” app from there. -Once you downloaded the apk then copy and paste the “Quick Shortcut maker” app to your USB pen drive. -In your other Android device. open a menu and then open the “Phone Clone” app. -Once open the tap on the “Agree” button and then select “This is an old phone”. -Then tap on the “Allow” multiple times. -Then you will get a “Scan QR Code on the New Phone” screen. -We have already get the “QR Code” option on our “Huawei mate P20 Pro” device. -After the QR code scan successfully, then your both android devices connect each other through “Phone Clone app”. -Now check your other Android device, you will get the “install App list”, just uncheck all and go down. -Then tap on the “App and Data”. -In the app and data, there you will see app lists. -Once finish then tap on the “Done” button to your other Android device. -Now connect USB Pendrive to Huawei Mate 20 Pro through USB OTG adapter. -Once connected, then you will get a popup window of the “File Commander”. -Tap => OK => Continue with Ads => Allow, to continue. -Now locate the “Quick Shortcut maker” app to your USB drive thats helps to Unlock FRP Huawei mate 20 Pro. -Now install the “Quick Shortcut maker” app to your huawei mate 20 pro device. -After tapping to install, then you will get a popup button, tap “Settings” from there. -Then enable the “Allow Unknown Source” options. -Now go back to the app install screen by tapping back arrow key. -Then install and open “Quick Shortcut maker” app. -Once you opening “Quick Shortcut Maker” app, then you will see “Input keyboard to filter” search box. -Then a list will open. -Select the very first “Huawei Home” from the list. -Then tap on the “Try”. -After that, you will back to “Not signed in” screen. -After that, just tap on the “Back” key. -Congrats, then you will access your device “Home Screen”. -To successfully Bypass FRP Huawei mate P20 Pro you need to set pin lock. -Then go down and check “Security & Privacy” and then tap on the “Lock Screen password”. -Now tap on the “set lock screen password”. -Then type any “6” digit password, to set screen lock password. -After that, you will see a option “Enroll Fingerprint” just tap on cancel. -Once restarted your device then entered the 6 digit password. -Then complete the initial setup. -Once initial setup complete then again ask the password, type the same password and then tap on next. -Congrats, Now you have successfully Unlock FRP Huawei mate 20 Pro. Thanks for visiting us, if you facing any problem with this method then you can comment us on below.